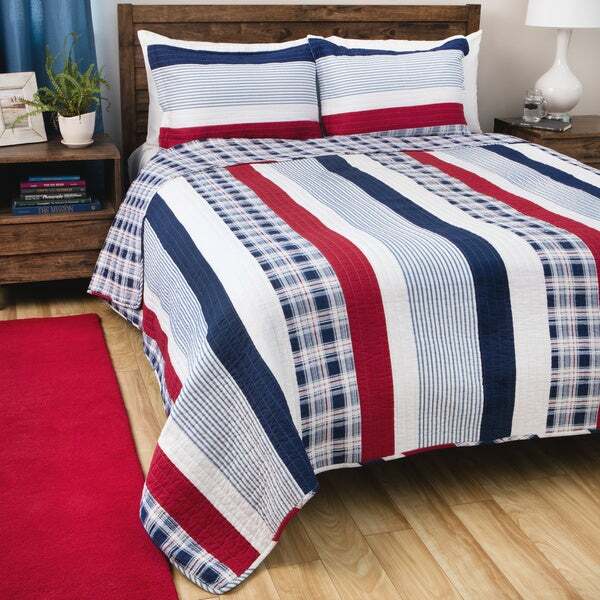 A contemporary classic, this Americana-colored quilt set gives any bed an updated nautical look. The quilt reverses to a coordinating all-over plaid and is oversized for better coverage on today's deeper mattresses. Available in twin, full and king dimensions, this set ensures you find a perfect match for your bedroom. This is a great quilt set for my teenage sons bedroom. Actually he picked it out. The quilt and shams were exactly as pictured in the photograph. The colors were vibrant. I washed the items before I put them on the bed and they washed up beautifully and are very soft. I've re-ordered a new one in King & awaiting it's arrival, however, this one (queen) the trim stitching was already coming loose & about 4" was out upon arrival. ?? really? appears no inspections are done prior to shipping. Also Queen size too small so ordered King. Pictures obviously show beds with larger sizes as a queen size on a queen bed does not look this way in the picture. If you want it to look like a bedspread versus comforter, order the next size larger. Heaviness is awesome & colors awesome. Again, I wish I'd receive this review 6 months from now to see how the quilt holds up & colors hold up after washing. I believe reviews need to depict the true value of items once they've been used. I could not be more satisfied by this quilt set. I was expecting something thin for the price, but was pleasantly surprise by its thickness when it came in. I bought it for my beach condo, and it is so beautiful! The color of it are very vibrant and give the condo a crispy clean look. I bought 2 sets (have 2 queen size beds), and just reordered 2 more sets. Cant beat it for the price :-)! Nice colors. Looks good in my son’s room. The quilt like texture is lightweight and easy to make the bed. I bought a twin and it is long enough on all sides. I just love this quilt set, i got it in the King size, I put blue and white striped sheet set with it and several stylish coastal pillows along with a navy blue and white chevron design throw @ the end of the bed. My bed is coastal white. It is light weight for summer needs. Wonderful addition to my coastal home. Just love it. I haven't had it washed or dry cleaned yet so I don't know if colors will be maintained. The Quilt set did arrive on-time. I am very pleased with the quality. As this is for a vacation home that has a nautical theme it was perfect. On the down side though, the photo appears that the Quilt drapes all the way down on the sides of the bed thereby eliminating the need for a bed skirt. Unfortunately, in my case, that is not the case. A bed skirt is needed because it only comes down to the box spring and the mattress isn't that thick -- therefore I was slightly disappointed. The quilt itself however is very nice. I ordered two of the twin quilts and I absolutely love them, but I was disappointed that they faded after one wash! The red fading was my biggest issue... The blues are not too bad. So just be aware that after one wash they will look very used like a quilt that has been around for a long time! poor craftsmanship on the sewing of the quilt. Batting was coming out in spots, materials didn't match up in spots where it was sewn. Just not at all what I expected. Also stated as oversized and was smaller than king size quilt I already owned. I had an image in my mind what I wanted for our grandchildren's room when they visit, but just couldn't find it. There are twin beds so I had to be careful of price as well. That's when I found these. I priced this same quilt elsewhere for $** more. The quiltsC came on time and fit the twin beds perfectly. They also make the room brighter than what I previously used. One of my best buys. I ordered two of the twin sets for one room and they are just perfect for the room. The look just like the picture online They seem sturdy, very soft. Very happy with this purchase. Although I love the look of this quilt set, it did not fit my king size bed. It was too short, width wise. So I am using it on my full size bed - which looks great! Beautiful quilt to accompany our sports themed room! The colors are bright and the quilt appears to be well made. I would say it’s on the thinner side, so it’s perfect for summer nights. I do not think this would be a good cover option for winter, however. The fact that it’s revearsible makes it that much more practice. . The colors were bright. It has washed and held up well in the two years that I’ve owned it. It’s soft and best for warm weather since I live in the South. I love this so much I got a second one. It is thick enough to keep you warm in the winter but light enough to be used in the summer also. Most of all it looks very nice on the bed! I already own 2 nautica sets that I have on bunks lower full. I added 2 of these in twins for the top. Theme is down hill asking retro. It's one of the best decorated rooms. This was a real addition to my son's patriotic bedroom. Bright colors, my grandson loved it! Great quality! It was delivered quickly. Purchased as a wedding gift. It was a hit. Good quality. Fast delivery. I’ve purchased several quilts from Overstock. Never been disappointed by any of them. Nicely made, Vibrant colors, especially a true red. Being reversible is a plus! Washes up well. I use cold water and gentle cycle. Just what I was looking for. "Is this quilt a true "patchwork" where there are strips of different fabrics sewn together, or is it one piece of fabric that is quilted?" It is one piece of fabric that is quilted. It is one piece but absolutely beautiful. Quality is superb. Very patriotic. Will go perfect in our 7 year olds bedroom! wanted these colors for my sons bedroom and had good reviews. "I need 4 of these quilts but can not tell if it requires a dust ruffle or it is a bedspread?" Hello LBIHomeAway, generally with quilts you do not need a bedskirt. They tend to hang pretty low, but not all the way to the floor, usually a couple inches off. So its definitely up to your personal preference. Thanks for shopping with us. "Is the blue in this quilt a royal blue or navy blue?" Hello cbmc, we try to represent the colors of our products accurately. Unfortunately, due to the difference in monitor colors we cannot guarantee that the color will match exactly what you see on your screen. Thank you for shopping with us. "Does the red color bleed or fade after washing? Is it soft? Is the stitching " quality" or does it look cheap? Thanks"
Hello stac06, If you follow the washing instructions on the product's care label, the colors should not bleed or fade. It is soft, and it has quality stitching. Thank you for shopping with us! "What is the measurements for the twin and the double quilt"
Hello 1woodchip, thank you for your inquiry! The size of the twin Quilt: 68 inches wide x 88 inches long. The quilt size for the double/full is 90 inches wide x 90 inches long. I hope this helps. Happy shopping! "Are the colors only red, white, and blue or is there also yellow on this quilt?"